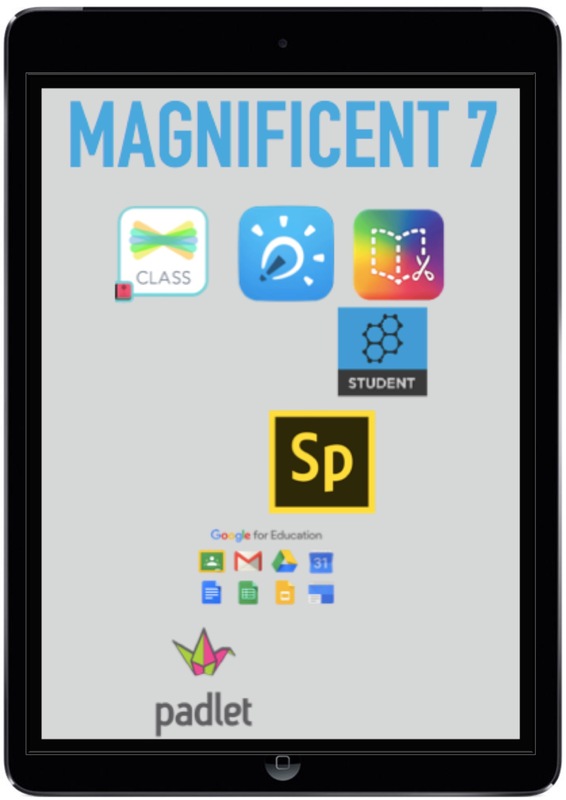 image	Encouraging staff to embed technology in the classroom: the birth of the Magnificent 7. As my blog name suggests, I love teaching with tech. I will have a go at anything – if I think it has purpose and adds value to learning. I’ve experimented, dabbled and tried with countless apps, devices and ideas. If it benefits, enhances or engages in learning, then it has value and will be incorporated into my classroom routines- if not then it is out. Its that simple, and I feel that is key. I’ve encountered barriers when implementing tech and e-learning in my classroom and the wider school. Many from teachers and parents. The old “all you do is mess about on iPads”, “what about handwriting?” and “where’s the evidence?” Has crept up time and time again. I think it’s important to make it known from the start that in no way does e-learning and technology replace any key skill, or in fact mean that work can’t be evidenced. Far from it, many amazing and wonderful practical and creative activities can be captured, shared, commented on and manipulated by children, staff who weren’t present and parents, thanks to wonderful apps like Seesaw. To answer the question of handwriting, yes its an important skill and one that is taught and practiced daily, but my reply is often “if I were not a teacher, I very much doubt I would use handwriting daily.” My shopping lists are done via reminders on iOS (see my previous post on using Siri to be organised), my diary is organised via Google Calendar, my notes and correspondence are done via text messages, tweets and email. I don’t even send Christmas cards anymore, just a digital message or image. Not because I’m that pretentious, it’s just the way in which the world and my life is moving and changing. But yes, it is a skill I still hold dear and needs to be taught. The barrier with parents are overcome by striking a balance. Sometimes the process can be using e-learning to build to a final piece of work. For example, my class struggle with editing and redrafting, but by using Google Docs it has built confidence, not to mention engagement in writing with reluctant writers (particularly boys). They are now happy to get ideas down because the safety net is that it is very easy to manipulate and improve sentences – and prove editing via turning on track changes. Sometimes the end product is a fantastic piece of creative work that has been built up using more traditional methods in analysing, planning, writing and then presenting or performing. A perfect example of this was when my Year 5 class supported Year 1 to create Christmas Letters to Santa using Spark Video, a magnificent piece of work from Read, Write, Perform by the incredible Lee Parkinson and John Murray. Parents were delighted by what their children had produced, but that couldn’t have been done without the key skills. The balance just has to be right. This has been key in getting staff on board too. It can be overwhelming when you want to enhance the learning of the children using tech, especially when you see how many different apps are out there. They are being used in countless different ways, for countless different things and when there is a person next door to your class (i.e me) who will have a go at anything, its off putting. I started by introducing Seesaw first, just to show how easy it could be to collect, share, evidence, mark and assess work. Once the teachers had seen the impact of Seesaw it was an easier way in. It made their life easier by collecting and marking work quickly and effectively, but also because the children lead it, it was no extra burden for them. The next step was to introduce other apps which could be used easily and effectively, but evidenced using Seesaw again. Luckily, I work in an incredibly supportive school. Teachers are generally willing to have a go, and my Senior Leadership Team are incredibly supportive in my ideas and beliefs. In preparation for my perfortmance management and a Governors meeting to outline the impact of e-learning across the school and wider curriculum, I decided we wouldn’t go down the route of expecting teachers and children to use a huge array of apps, we would just focus on being brilliant at using a select group for a range of purposes across the curriculum. It started out as 5 apps, but this was just far too hard. Every time I made a list of 5 key apps, I’d remember others! So finally we settled for what has been dubbed the Magnificent 7. Our mission is to be skilled in only 7 key apps (however, some on the list are a suite and include more than one) and to use them effectively for a wide range of reasons. After a tough few days whittling down and editing the list it was ready: Seesaw, G-Suite (formally Google Apps for Education), Book Creator, Explain Everything, Adobe Spark Suite (Spark Post, Video and Page), Padlet and Socrative. We changed our emails from the local authority to our own domain about 8 months ago. This was for a number or reasons, but the main one was the huge array of extras we couldn’t access. Expediations to take our children on virtual fields trips, but a few wifi issues are hindering this. Post – create professional photos for posters, displays and ebooks (Book Creator) by adding text and effects. We have just rolled these ideas out in November 2016. Slowly but surely, they are starting to become embedded in our schools ethos and daily routines. The children are becoming increasingly confident in using them. Staff are supported by our recently updated and appointed Digital Leaders (in KS2 there are a number of Digital Leaders in each class) who receive training in the apps, experiment with techniques and then offer support and ideas to teachers and children back in the classroom. It’s proving incredibly successful, becoming a way of school life and most importantly, taking the strain off me. We are working our way through each of the apps to really hone in on their uses, but when you see the children working on them, you know the future is in magificenmt hands. Previous Using Siri to be more organised. Next Homework and Revision: How Google Classroom, Quizlet and Padlet transformed homework. I’m just starting my iPad adventure at my school. It’s great to see how you’re using technology. Thanks for sharing. I’ll definitely be looking into your 7 apps. Thanks, appreciate the feedback. If you have any questions or need any help then please feel free to ask and I’ll do my best. I’ve trialled so many different things, some are amazing and some were a total waste, but the impact in school is phenomenal.